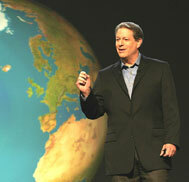 Have you seen "An Inconvenient truth"? A great documentary film about the pollution on the world... You have to seen it! Yes, I saw it and loved it. I liked the clear way he presented the information. Thanks for comments...This problem is very important...We have to do all something! I did see the movie. I enjoyed it and found it to be educational. I did also think that it was a bit of a commercial for Al Gore's political campaigning though, and I didn't like those parts. But the message was good. agree with you, it'as also a help for Al Gore' political campaigning but i have seen this film with students and they was very surprising by it!